WinTV-HVR-1600 is a dual format TV receiver for your PC. Watch ATSC digital TV or analog cable TV, in a window or full screen. Watch and record all ATSC formats, including the highest definition 1080i format! WinTV-HVR-1600 includes TV scheduler, the Hauppauge remote control and IR blaster to control satellite and cable TV set top boxes. The Hauppauge 1178 WinTV-HVR-1600 includes dual TV tuners to let you watch both digital and analog television on your PC, in a window or full screen. With PVR software and built-in hardware for MPEG-2 encoding, you can also record television onto your computer for viewing later without slowing down your computer. Dual TV tuners to watch digital and analog television signals. Compatible with ATSC and QAM digital TV, and analog cable TV signals. Dbx-TV stereo decoding for spectacular sound. Dual tuners lets you watch both digital and analog signals. View larger. The WinTV-HVR-1600 also lets you watch and record QAM channels, which are unencrypted digital channels broadcast by your local cable operator. If you don't have access to digital television channels yet, you can also watch regular analog cable television. And with the included remote control, you can control your cable TV or satellite set top box. In addition to high-definition video, the card also features a dbx-TV stereo decoder for great TV sound. The card has Composite/S-Video and audio inputs that allow for connecting VCRs or cable/satellite set top boxes. Your Own Personal Digital Video Recorder! With the included software, you can easily record TV shows to your hard disk using MPEG-2. Several recording options are available depending on your playback needs; higher quality video requires more disk space. Generally, 5 gigabytes of disk space is used per hour of ATCS digital TV recordings.. Thanks to the built-in hardware MPEG-2 encoder, your PC continues to run at full speed even while recording. 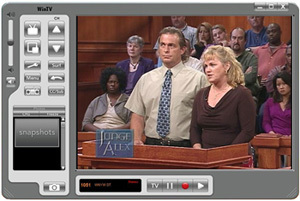 The WinTV application offers an elegant interface to watch TV in a window or full screen. View larger. With the WinTV-Scheduler software, easily schedule the recordings of your favorite television shows daily, weekly, or just once. You can then play back the recordings at your leisure, burn them onto CD or DVD for playback on another computer or your television, or with video editing software (not included), you can edit the shows. This is great for saving favorite movie clips, or of your favorite teams dramatic last-second win or your favorite player's grand slam. 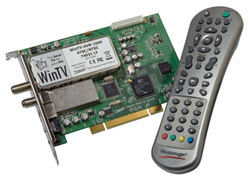 The Hauppauge 1178 WinTV-HVR-1600 plugs into a PCI slot and is compatible with Windows Vista, XP with Service Pack 2, and Windows XP Media Center Edition. 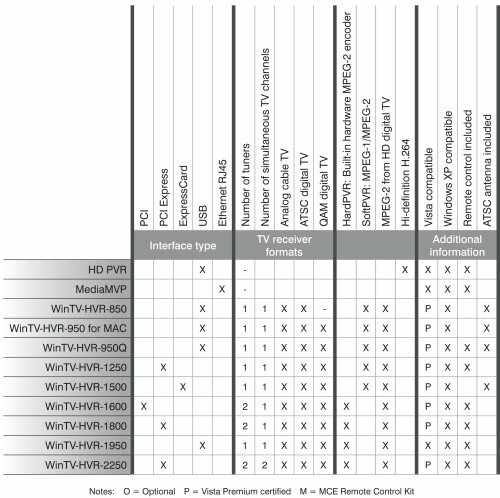 With XP-MCE and Vista, you can add the WinTV-HVR-1600 as either the primary or secondary TV tuner. The Microsoft Media Center application supports up to two TV tuners so you can watch on channel while recording another. WinTV-HVR-1600 PCI card, IR remote control receiver, IR Blaster (remote control), CD-ROM with WinTV software. Works flawlessly with Vista mediacenter!! This is a great tv tuner card. I was a little wary of opening up computer to install card but went without a hitch--went with this Hauppauge instead of tuner stick and glad I did -once card is installed it is out of way and a permenent part of pc case. The analog cable reception is pretty good-this is what I am using with the media center-for some reason the media center does not seem to scan in digital channels via anntena--no matter--- the hauppuage program which installs on your pc desktop works great to bring in digital tv anntena signals--you can watch two tv channels at once! Nice product hard to configure. It does what it needs to do but the description is misleading. This is not for digital cable but rather for QAM only (HD signals). It was confusing how to set it up with BeyodTV product but there are very good forum out there that helps. If anyone wants a card for digital cable - please note that most channels on digital cable are SDV (Switch demand Video) and this card does not support that. Great Card! Easy to Install! Needs Better Software! I give the card 4 stars and the software 2.5 stars, for an overall rating of 4 stars. Card produces great picture quality. I am using an old outdoor antenna plus a 20db to 30db adjustable amplifier from Radio Shack. I only got about 4 channels without the amplifier and between 28 to 50 channels with the amplifier. I bought a big new HDTV antenna, but I need to install it outdoors, because it doesn't work well enough indoors. HDTV is way better than analog. The picture quality is perfect and much higher resolution. You need a reasonably powerful computer to handle this card. At first I was using a PC with an Athlon XP 1800+ CPU and Radeon 9700 card. I could watch HDTV on this, but there was some occasional lagging or stuttering of the video. It was not quite fast enough of a computer. Then I tried to upgrade the CPU, and ended up killing the computer. So I built a brand new computer with really high specs! My new PC has a Athlon 64 X2 5600+ cpu, 2gb Corsair ram, and EVGA GeForce 8800 GTX graphics card. Now it handles the HDTV very easily. I can even play a recorded video at the same time as I have the HDTV running. The WinTV software works, but it is lacking a couple of things. First of all, it will not adjust the proportion of the picture to your monitor. When you watch in full screen mode, it just stupidly stretches the whole picture to cover your entire monitor. I use a 16/10 proportion widescreen monitor. Therefore all the 16/9 and 4/3 tv shows are stretched out of proportion in full screen mode. Also, the timer recording software does not work! That is, when I try to schedule shows for recording, that just doesn't work. I bought a WinTV card a few years ago and I returned it because the software was utter crap and would not even install properly. This new WinTV software is far better, but it still needs improvement for the above reasons! Why do they insist on releasing good hardware with inadequate software? Is it so hard or expensive to create decent software with complete functionality? I doubt it! I used to do computer programming, and I think with just a little more effort they could've made this software complete. I'm not asking for some super fancy software, I just want something with a complete set of basic functions that I need! Another problem was that they don't give you any software to play your recorded HDTV programs! You can record them, but not play them with your WinTV software! So I had to find software that would play these big HDTV files. So I got VLC (a free program) to play the files. It works great. I also got the BeyondTV software to watch HDTV. I use that one most of the time instead of the WinTV software. BeyondTV shows all the programs in correct proportion on my 16/10 monitor in full screen mode. Also, the BeyondTV timer scheduling feature actually works and is easy to use. However, BeyondTV has one problem, in that it doesn't have an instant recording feature that works the way I want. So when I need to record something immediately while I watch, then I go back to using WinTV for that. So I am using three different pieces of software for all my TV viewing. I should only have to use ONE and WinTV should have provided that! I haven't tried to do any video editing. The video editing software that comes with WinTV is probably a piece of junk and I haven't tried it yet. I know it has minimal capabilities. Fortunately there is rarely a show that I'd want to edit and keep permanently, but I'm gonna have to find some good software to edit a few important shows and burn them to DVD. From what I've read and from my own experience, it seems that this card does not have a very sensitive tuner, so it may be difficult for you to get all the available stations. Even with a 30db amplifier, I'm still getting only about 30 stations and some of them are not very strong. I can get 52 stations on my Zenith converter box WITHOUT using an amplifier and all 52 channels are rock solid! I probably will consider getting a better HDTV card eventually, if my new HDTV antenna does not get me all the channels with this card. I bought this card to use with my Vista Home Premium (Media Center) PC. I wanted to be able to record and watch over-the-air HDTV programs and pretty much use the PC in the home office as a TV. It works very well. I installed the card and let Vista find the driver automatically on the included CD from Hauppauge. The drivers installed well... I hooked up an inexpensive HDTV antenna to the ATSC digital tuner input on the card and was up and running with awesome quality HDTV and Digital TV in Vista Media center within a few minutes (after the Vista Media Center setup). At first, I did not install any of the software on the CD at all (except the driver which Vista found). Worked great just using the keyboard of the PC. Next I wanted to use the remote, so I installed just those tools from the Hauppauge set-up CD. Again, worked great with no messing around. This is where I found one very small issue that I guess has caused me to go 4 stars instead of the 5 it probably deserves. The dumb cord for the remote control receiver is way too short.... it does not reach from the back of the PC (sitting on the floor) to the monitor (sitting on the top of the desk) - a configuration I assume is very common. I have to mount the IR receiver on the front of the PC but most people want to point the remote at the image on the screen, so it doesn't work that well. Would have been SO much nicer if I could have put the IR receiver on the monitor. Small gripe, yes... but one of those annoying little things. But, don't let that stop you from buying it. I build Media Center PCs as a hobby for the past 2 years and I've played with a fair share of tuners from Avermedia, Divico, Hauppauge, EMuzed, ATI, nVidia, etc. As I rebuilt my Sony XL-1 CE-EPC, I wanted to swap our the OEM card and an old ATI HDTV Wonder card I put in with something more stable than the OEM analog + HDTV wonder that also fit the XL1 chassis. After using the HVR-1600 for the past 6 months, I'm pleased to report that ATSC tuning/channel change is quite fast, it has good ATSC signal sensitivity and most importantly, stable while running Windows Vista Ultimate Media Center app. I do get a glitch on occasion switching between analog and digital channels with a MCE 'video error' message. I can't target the problem but I will say the OEM analog card + the HDTV Wonder card also exhibited similar issues when switching between A & D channels. Last but not least, image quality, I find the analog channel has good brightness and decent color saturation (most analog tuner cards have problems with color balance anyways). The digital tuner as expected didn't degrade the ATSC signal and does a great job with brightness, contrast and color saturation as well. I bought a Hauppauge WinTV-HVR-1600 last year. It works, but very poorly. Using an indoor HD antenna I can pick up only three local HD stations. The high definition picture is decent, but nowhere as good as on a HD television. I would like to point out that I am using a high-definition Samsung monitor with my computer. Meanwhile, analog stations, coming in through cable, are much, much worse. The picture is fuzzy, expecially when watching in full-screen mode. But my main gripe is that I can't pick up any digital stations through my cable provider, Comcast. The Hauppauge card with its QAM ability is supposed to let you do this. But I pick up zero digital stations through this card. However, I have a Toshiba HD television and it picks up many digital stations from my cable. A year ago I wrote to Hauppauge to complain about this and I received a reply saying, "Our engineers are aware of this problem with Comcast and are working on it." Well, a year later I wrote to them asking for an update, and other than an initial e-mail asking me what software I was using, I have not received another response from Hauppauge support, even though I have written them many times. It is clear to me that they do not want to take any responsibility for their defective product. I will never buy a Hauppauge product again. The card is for ATSC/Cable (NTSC), but if the hardware level matches a certain version you can download an update from the manufacturer's web site and QAM is made available. This is good since in 2008 the transition to digital will happen. However, not sure whether this is my cable company's fault or the QAM drivers, but I do not get more than 13 QAM channels. Having said that, the card works perfectly with ORB 2.0 and I was able to set a show to be recorded from overseas. I just hope QAM gets better, but even without it, the card is worth it. UPDATE 10/09/2007: Some incompatibility with ALL video streaming software I tested: WINDOWS VIDEO ENCODER, VNC, etc. When Video shows up, no audio. ORB seems to be the only video streaming method that works. If you try to serve the signal directly from your computer, it seems to not work. I run Vista Ultimate on a home-built PC with an AMD X2 4600+, 2GB RAM, and a 7600 GS GeForce video card. I connect to my XBOX 360 on a 100MB network and use the XBOX's media center extender functions to watch television. I receive my TV signal over the air using a CM 4228 roof mounted antenna in the SF Bay Area. 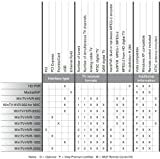 This card, with the newest drivers, is QAM capable, but only if you use the packaged TV software, and it might also be QAM compatible with other TV software suites, but not Vista Media Center.